Margot Freudenberg was born on August 8, 1907 in Hannover, Germany, to Dr. Henry Strauss and his wife, Ella Ganz. Dr. Strauss was a pediatrician and the family was lived a comfortable life. Margot and her sister, Hilda, often attended the opera with their father. Margot obtained a degree in physical therapy from the University of Munich in 1928 and opened her own practice. In 1929, she married Walter Freudenberg, whose family owned a successful department store in Essen, where the newlyweds settled and had a baby boy, Henry. Margot was forced to close her practice in 1930 as the political situation for Jews in Germany began to worsen. She began to look for options to get her family out of Germany, including traveling to England to seek help from her relatives there. Others thought Margot was crazy for wanting to leave her country, but the events of Kristallnacht proved she had been correct to look for ways to leave. She had been detained by the SA and interrogated for an entire day before being forced to scrub antisemitic graffiti from the streets with a toothbrush. 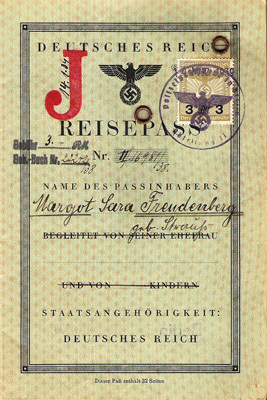 The Freudenbergs finally obtained visas to travel to the United States on September 7, 1939, nearly a year after Kristallnacht. The family had already left Germany on June 28, 1939, and traveled to England, where they stayed until departing for America on March 1, 1940. After arriving in New York City, the Freudenbergs settled in Charleston, South Carolina. Margot's sister, Hilda, already lived in Greenville, South Carolina.